Stick to your keto diet without giving up your favorite foods with these 100 easy-to-make high fat, low-carb snacks. Starting a ketogenic diet—high in fat, low in carbs—doesn’t mean giving up on all your favorite snacks! Instead of eating foods that might prevent you from entering ketosis, you’ll need options that will help your body burn fats instead of carbs. You’ll find just what you need in Keto Snacks, featuring 100 easy, delicious recipes for sweet and savory low-carb treats. Learn to make “fat bombs”—small energy-filled snacks with low carbs and high fat, like Pizza Balls or Sunbutter Balls. Try other savory keto snacks like deviled eggs or guacamole, or go sweet with some chocolate mousse for dessert! In Keto Snacks, you’ll find yummy recipes for Creamy Rosemary and Prosciutto Baked Avocado, Chorizo-Stuffed Jalapenos, Coconut Almond Truffles, Peanut Butter Cup Cheesecake—and much more! You’ll be sure to find a tasty keto snack to satisfy any craving, any time of day! "Another source of great low carb recipes? 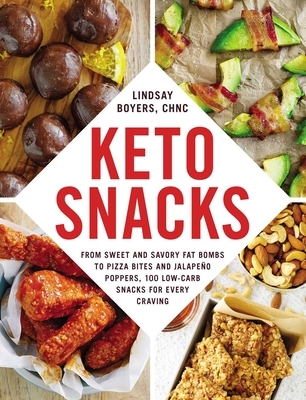 Lindsay Boyer’s new book Keto Snacks which I devoured! Her recipe for Butter Hot Chocolate is worth buying the book for! If you think you’d be deprived on a low carb diet, this book will convince you otherwise!" "Just great, yummy snacks for anyone on a low-carb diet, even if not keto ... great for low-carb and keto entertaining and parties this holiday season." "Great book ... I literally had to get out the sticky notes when I was flipping through the recipes because I saw so many I wanted to try right away. I know it's called Keto Snacks, but many of the foods I've prepared from it I actually used as part of a meal."